With Readly you can read Raspberry Pi For Kids and thousands of other magazines on your tablet and smartphone. Get access to all with just one subscription. New releases and back issues – all included. The Raspberry Pi, along with the BBC Micro and the Arduino, were developed with one goal in mind: to get kids into coding, and prepare a new generation of developers for the digital masterpieces they will one day create. The Pi is as small and as simple as a computer can get, and with a few extras like a screen, a keyboard, mouse and SD card, you’re ready to browse the web, do your homework, code your own video games and even create your very first robot. Raspberry Pi for Kids aims to make all of this even simpler, with easy tutorials and fun projects suitable for a wide range of ages. 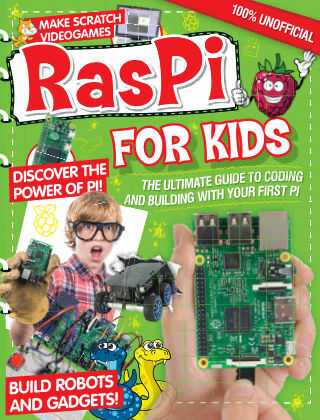 With Raspberry Pi for Kids, there really is nothing stopping you from taking over the world of coding.Featuring: Pi Survival Guide - So what is a Raspberry Pi? Learn all the basics in our Survival Guide. 10 Steps before you start - So now you know what it can do, let’s see how we can prepare to get started on some projects! Projects - Whether it’s programming your own vide game or building an Explorer robot, you’ll learn to do it here.